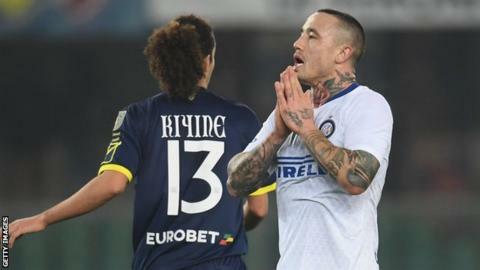 Inter Milan midfielder Radja Nainggolan has been suspended by the Italian club for “disciplinary reasons”. It is understood the decision was taken after the former Belgium international was late for training and not for the first time. The 30-year-old has also been fined a substantial sum of money. Nainggolan joined Inter from Roma in a £33m swap deal in the summer and has scored three goals in 15 matches for Luciano Spalletti’s third-placed side. He will miss the Serie A game against Napoli, who are second, at the San Siro on 26 December. Nainggolan was dropped for a Roma match at the start of 2018 over a New Year’s Eve video in which he drank, smoked and cursed. He retired from international football after failing to get in Belgium’s World Cup squad for this summer’s tournament in Russia.